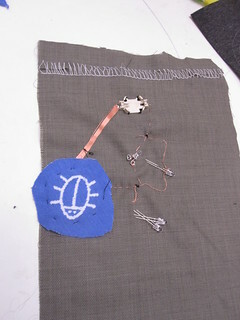 This one and half days workshop is an introduction to E-Textiles materials and techniques for fashion and textile design students. 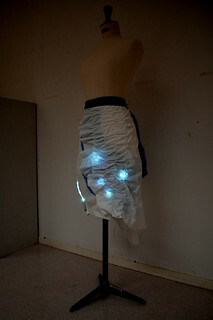 E-textiles, also known as electronic textiles or smart textiles, are fabrics that enable computing, digital components, and electronics to be embedded in them. 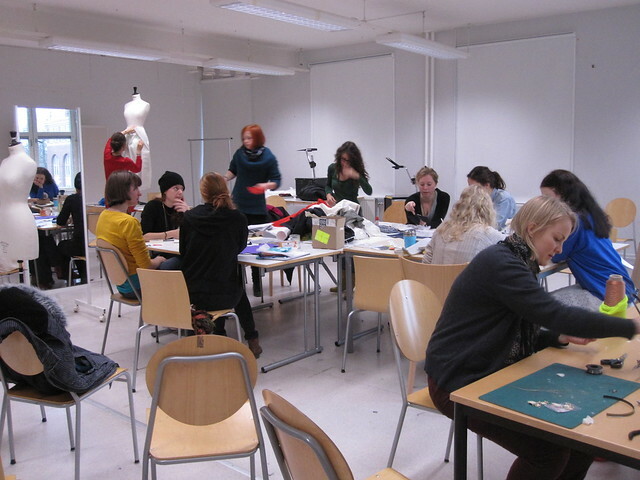 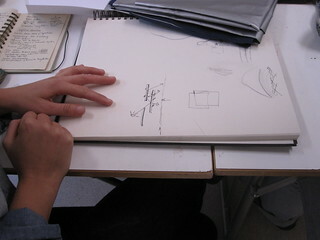 * The course starts with short lecture about current E-Textiles projects in art and design field. 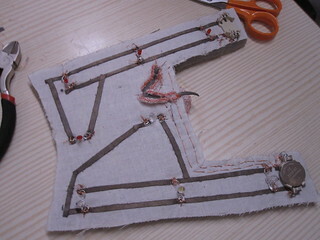 Students will be introduced to different kinds of conductive textile materials and its use in E-textiles projects. 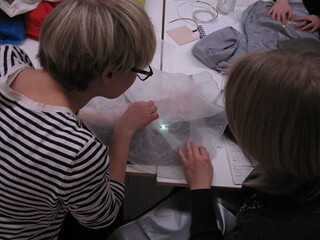 The following hands-on workshop explores the use of “light” in textiles and fashion projects. 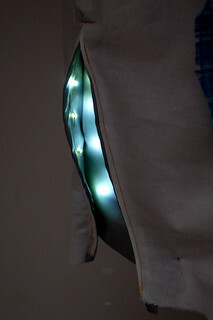 We will look into different kinds of light source technologies, various kinds of diffuse/ reflection techniques, interaction possibilities with textile sensors.. so on. 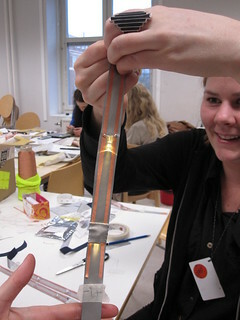 In this workshop, we will especially focus on LED (Light Emitting Diode) as a simple light source technology to come up with hands-on experiments to explore its expression possibilities. 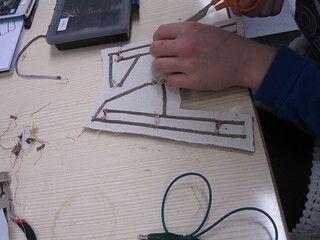 On the first day, students were introduced to various kinds of e-textiles project from fashion, textile and art field. 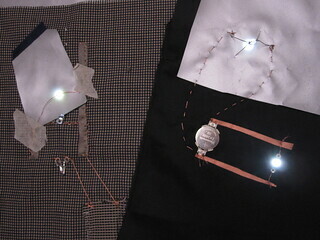 Then they were introduced to e-textiles materials and simple LED circuit schematics to create their own e-textiles circuit using e-broidery technique. 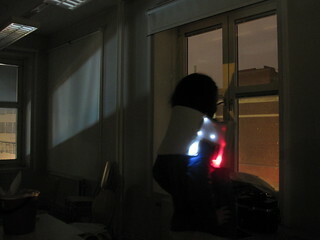 On the second day, students were introduced to different kinds of expression examples with lights, such as defuse, reflect, shadow and interaction. 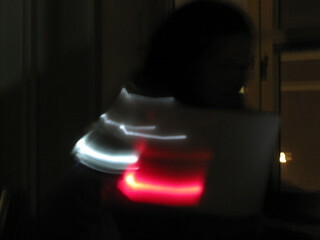 They formed 5 groups to work on their own expression experiments with lights. 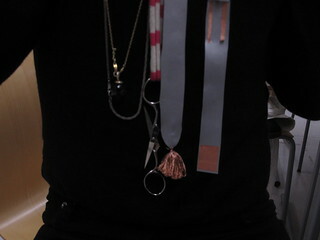 Here are some of the outcome. 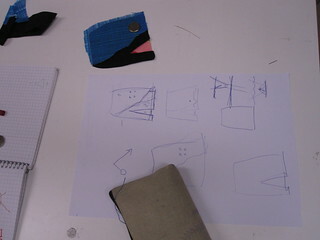 This group was interested in the shape of reflection on different materials. 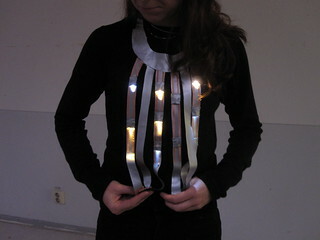 Their project idea is to make a light necklace that changes the light as the wearer moves. 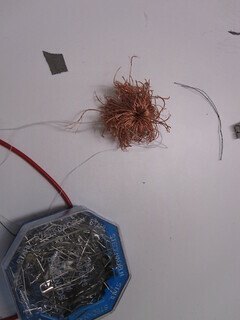 They have used conductive thread to make pompom that hangs from the tip of the necklace working as contact sensor. 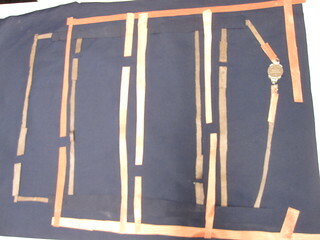 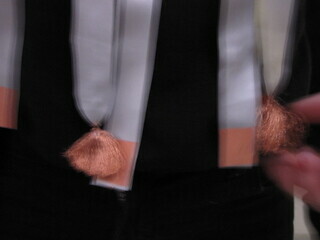 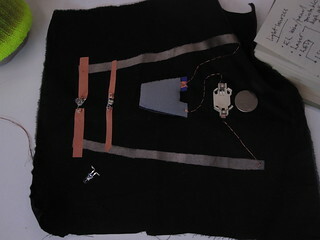 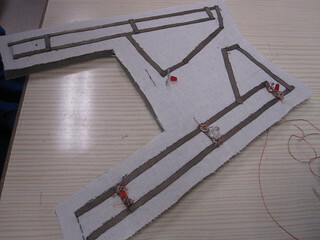 They have used conductive fabric as electrical connection on thin stripe of fabric. 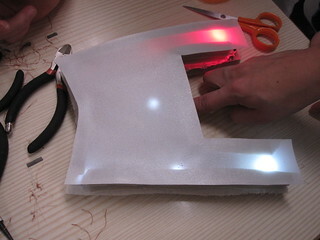 LED is placed on the side way on the reflective material to create long casting light. 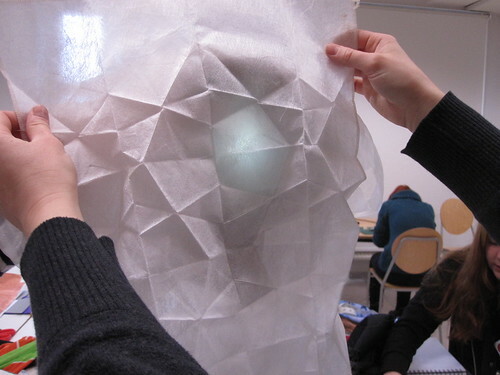 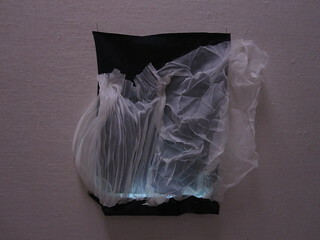 Group2 worked with the idea of reflecting light and semi transparent fabric. 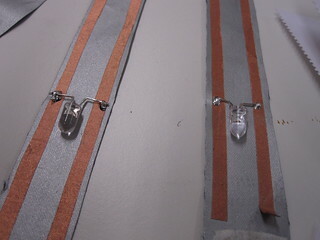 They have worked with SMD LED to make the embedded light source circuit. 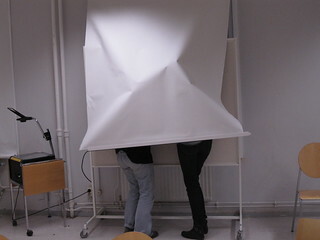 To work with subtle expression of light, they had to find a dark space in the room. 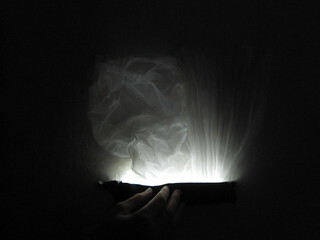 The pleating creates an additional expression to the light. 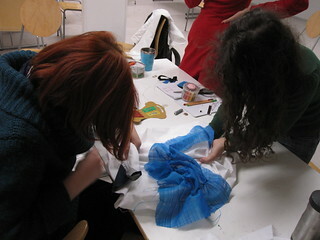 Further investigation on pleating techniques and expression will probably bring very interesting result. 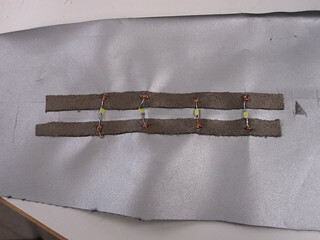 Group 3 looked at the defusing property of light and how they can control them. 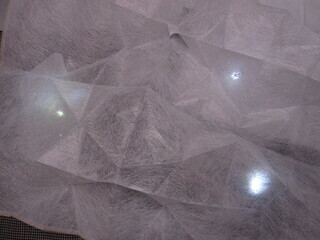 They have experiment with spacing the light source and reflecting them back. 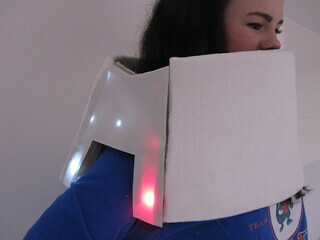 Group 4 made a super hero neck warmer (protector?) 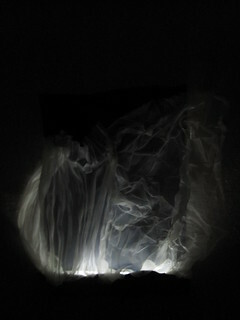 with light. 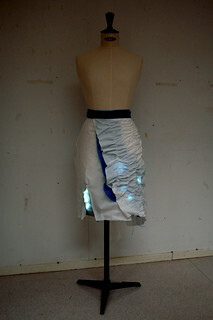 They experimented with colored light and defuse material in wearable context. 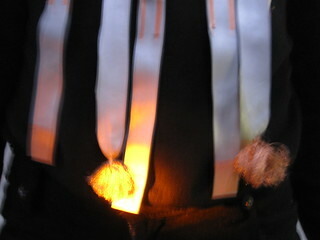 They have used thick foam to space the light from the defusing material and also to achieve a stable placement on body. 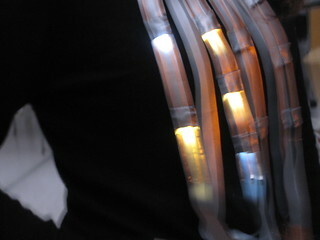 The circuit included two different color light with a button, making it a bit complicated to connect. 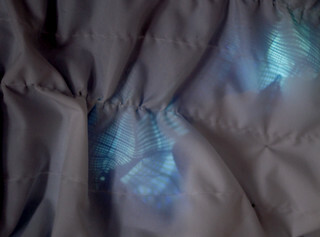 The button controls the amount of light on the piece. 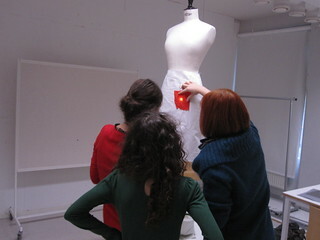 This group worked with the idea of wearing light as part of a garment. 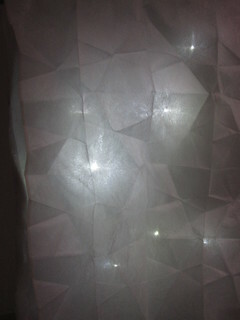 They have experimented with two ideas, reflecting the light through slit, and diffusing light with textured textile to give a texture and color to the light. 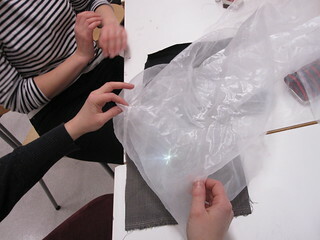 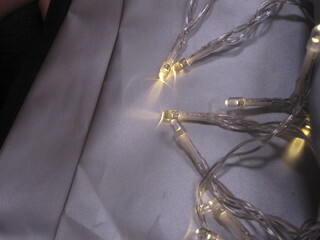 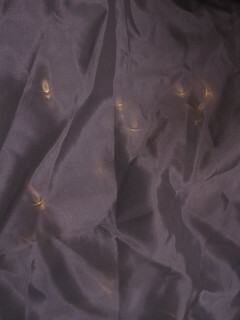 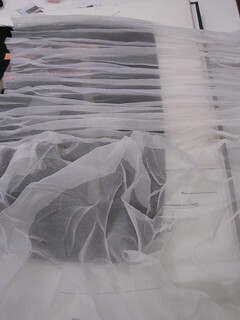 They have used smocking technique to give a space between the light source and the covering fabric. 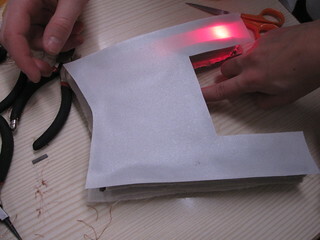 Even though they have used just white LED, they could achieve red and blue light using colored textiles. 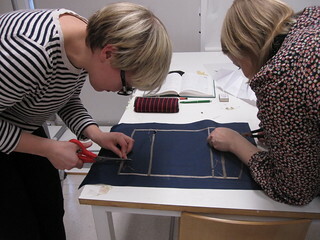 December 14, 2012 | Filed under Workshops.